Itâs true that Kid Zugâs boxing skills were a shadow of what they had been 35 years earlierâand that his opponent, âHappyâ? Frey had a big-mouthâbut for the boys in the village of Pescadero, a boxing match with world champ Abe Attell could not have brought them more excitement. Details of the 1918 event remain sketchy but as the day of the fight drew near people came from all around. When the moment finally arrived, the combatants entered the ring and the crowd was breathless. Kid Zug was stone-faced and silent. Happy Frey was clearly nervous and ringsiders wondered if either fighter was sober. The referee spoke to them for a moment and signaled for the bell to start the fight. Both boxers were tentative. Zug kept his hands high to protect his scarred face. Happyâs inexperience quickly presented an opening for the Kid who launched a solid right cross which staggered Happy and knocked out several of his teeth. Although the ending was unexpected, the stunned crowd seemed satisified with the outcomeâespecially those that had bet on the Kid. Zugâs ability to strike so swiftly at his advanced age amazed everyone. Pescaderans would never forget the short boxing match on San Gregorio Street. 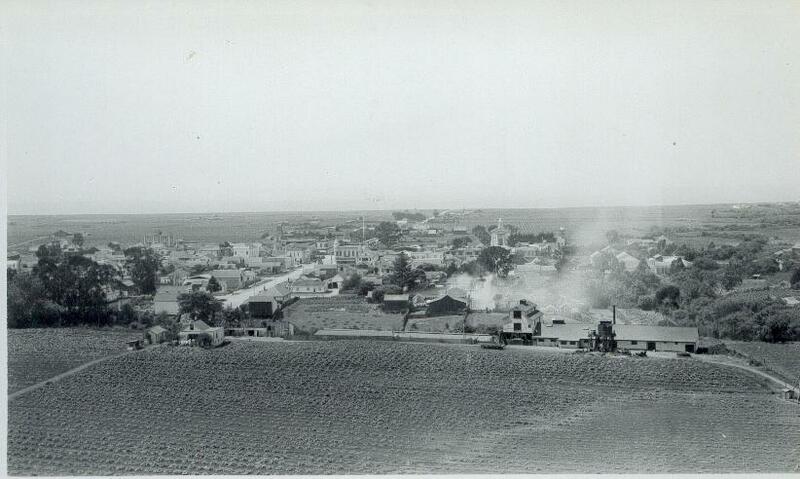 But a year later, in the summer of 1919, a brutal murder occurred in Pescadero. It ws a seamy case involving the slaying of a wealthy, elderly widowâand all bets were that the people Zug worked for had something to do with it. Around this time it was report4d that Zug fell ill with pneumonia. 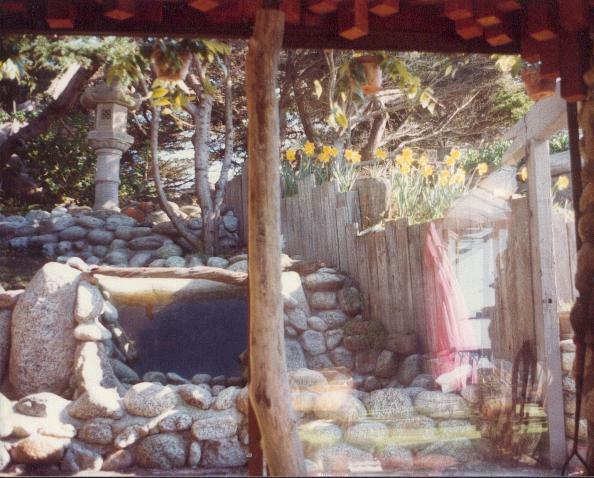 In Pescadero many villagers were coming down with the dreaded âSpanishâ? flu, the post-World War I influenza pandemic that took the lives of millions worldwide. Some insiders suspected that Zugâs illness might have presented a perfect cover to get him out of town during the murder investigation. For weeks the Kid was confined to a hospital room in San Mateo. As soon as he recovered, to everyoneâs astonishment, Zug was back on the wooden sidewalks of Pescadero, intimidating and menacing. Not long after returning to town, Zug faced real trouble. According to official court testimony and leaks to the local press, he was a major principle in an assault case. On a late Saturday night in September 1919 the lightweight pugilist was accused of badly beating 40-year-old Frank Goularte, the 190-pound son of the Pescadero blacksmith. In the melee, Goularte suffered two black eyes, a fractured nose and bruises on his face and head. While he was being patched up, authorities questioned Frank Goularte. 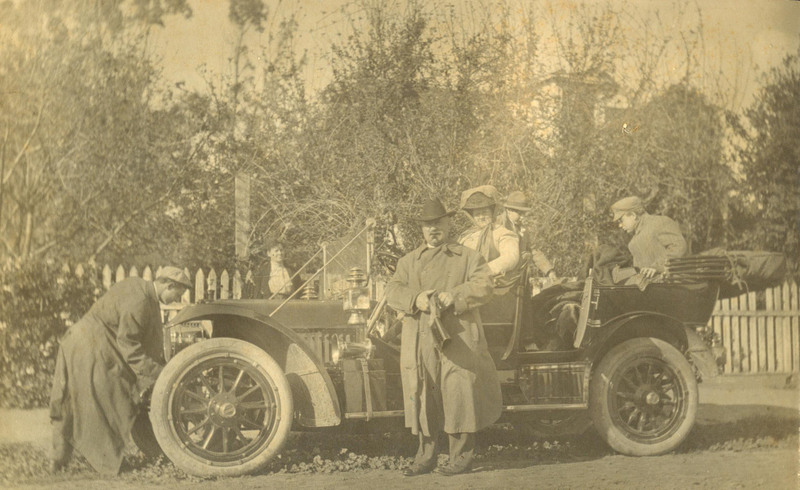 Young Coastside artist Galen Wolf (at far left, cranking up the machine) with his family in front of their home in downtown Half Moon Bay, circa 1912. 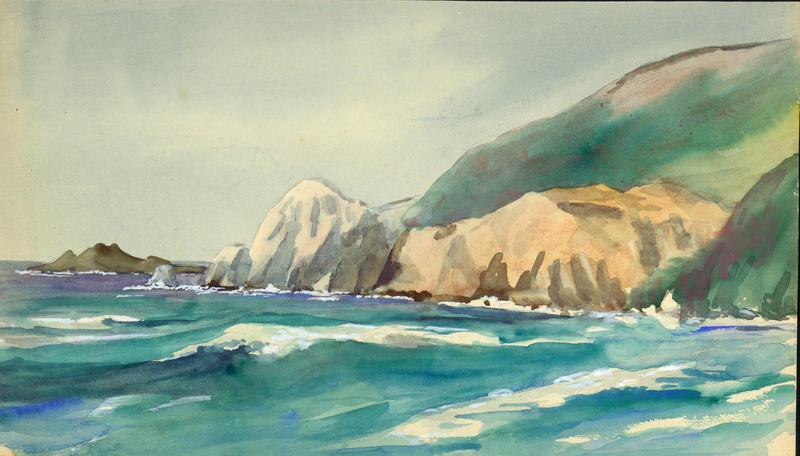 This unsigned watercolor of Devil’s Slide was painted by Galen Wolf or one of his students. While many Pescaderans must have been intimidated by Kid Zugâs battered-looking face–âHappyâ? 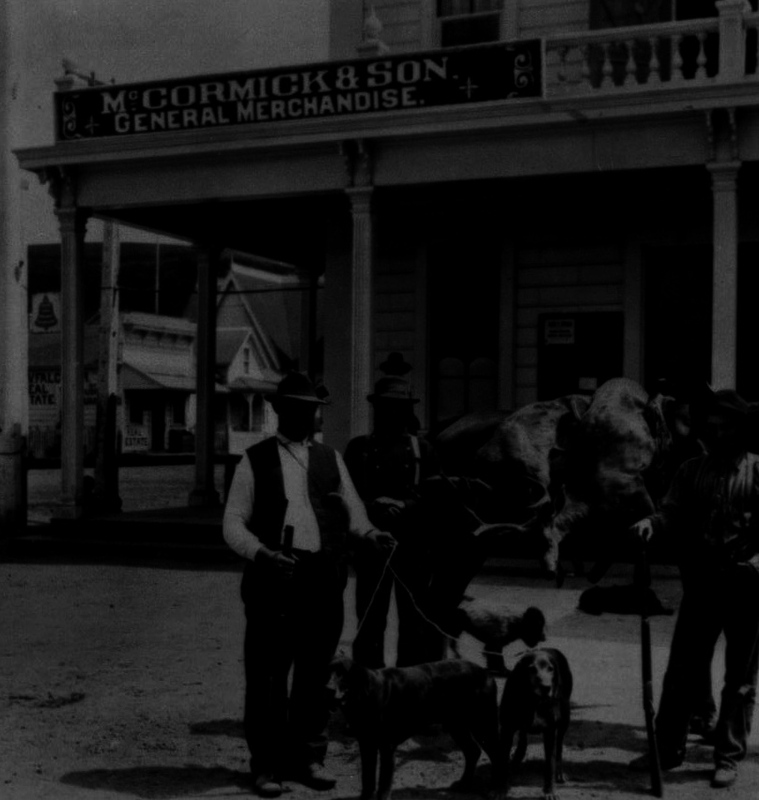 Frey, whose constable father Herman owned the Elkhorn Saloon on San Gregorio Street– took one look at Zug and boasted to one and all that he could knock him out flat. Happyâs exuberance could be attributed to his youth, or was it the alcohol content of his favorite beverages? Unfortunately, his boxing experience was limited to fist fights with the local town toughs. Nevertheless, Happy remained confident, knowing that Kid Zug was probably close to 60 years old. Happyâs boasting soon reached the Kidâs ears at the Swanton House where Zug was rooming. In its glory days the Swanton had been the centerpiece of the resort town, but by 1918 it had become a crummy, rundown hotel. Kid Zug was not about to leave Happyâs arrogant claims unchallenged. The confrontation was unavailable and word of their contest quickly spread about town. The Kid may have seemed too old to fight, but his credentials as a boxer were much discussed. He was a 135-pound lightweight, a former sailor turned professional pugilist. 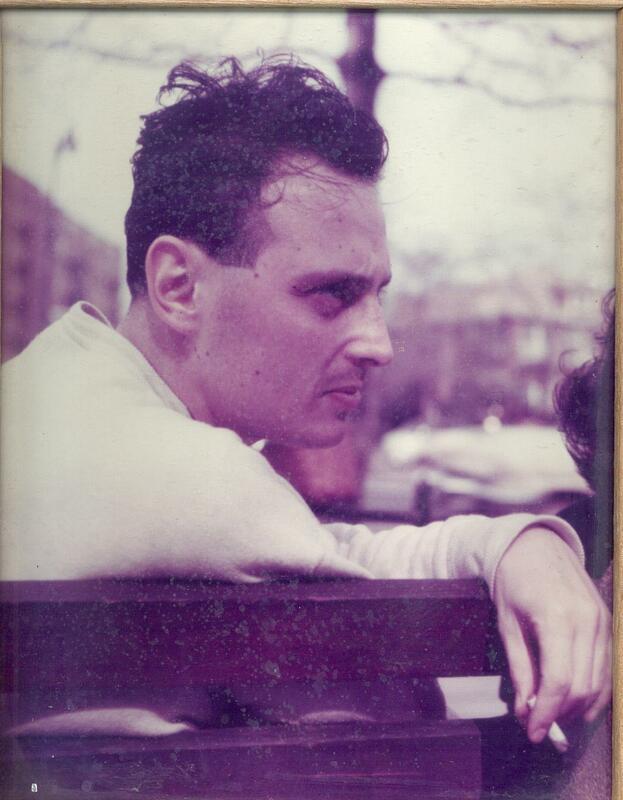 His early skills were honed in the violent back rooms of saloons on the East Coast. His face revealed the scars of many tough battlesâin and out of the ringâand it could very well be that the Pescaderans had never seen a professional boxer before. Those included to support Happy Frey felt that the Kid was long past his prime, down on his luck, in bad shape, and that liquor had gotten the best of him. They pointed out his slurred speech, the result of repeated beatings. They said he was a âlittle wacky from getting hit in the head.â? Yet Zugâs ability to intimidate was not impaired. With merely a glance he could wither nearly anybody he encountered and that was exactly why he had been hired. Happy Frey was a pure Pescaderan. 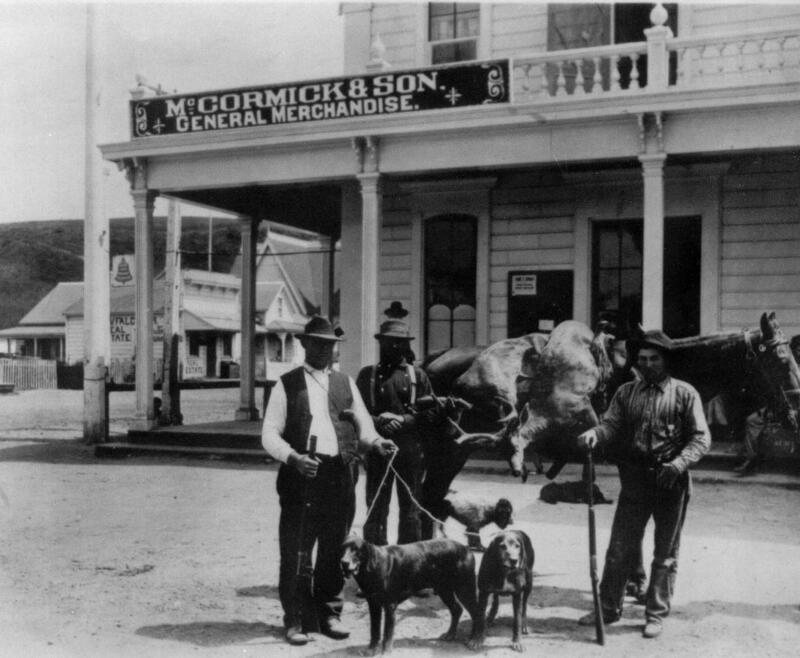 His father, Herman, was the local constable as well as the owner of the Elkhorn Saloon. His mother, Lizzie McCormick Frey, was the lady bartender with the trademark deep voice. 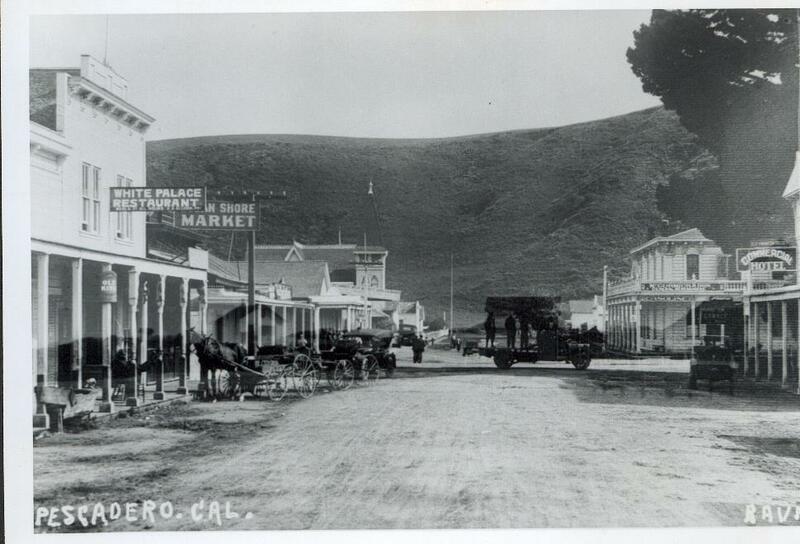 And her father, John McCormick, had at one time owned the renowned Pescadero House, Swanton House and the townâs general store. To the folks who were running Pescadero, the fight was an event sent from heaven. Booze would flow and cash registers rings. The customers would bet on the fight and have dollars in their pocket. Arrangements were quickly drawn up, and construction of the outdoor boxing ring began at the southern end of what was then called San Gregorio Street, near the townâs landmark flagpole. 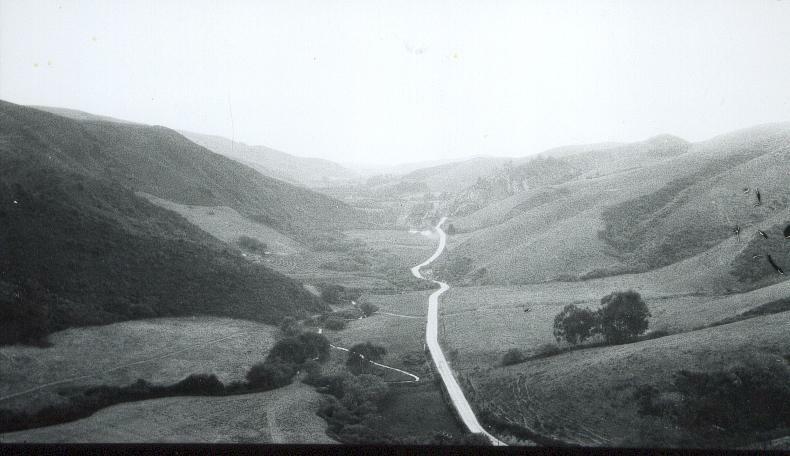 The old San Mateo-Half Moon Bay Road led to the quaint town of Half Moon Bay. Please click to enlarge. (Note: The true story of âKid Zugâ? was stitched together, using old newspapers to pick out a description here, another thereâuntil I gathered enough pieces for a word picture). 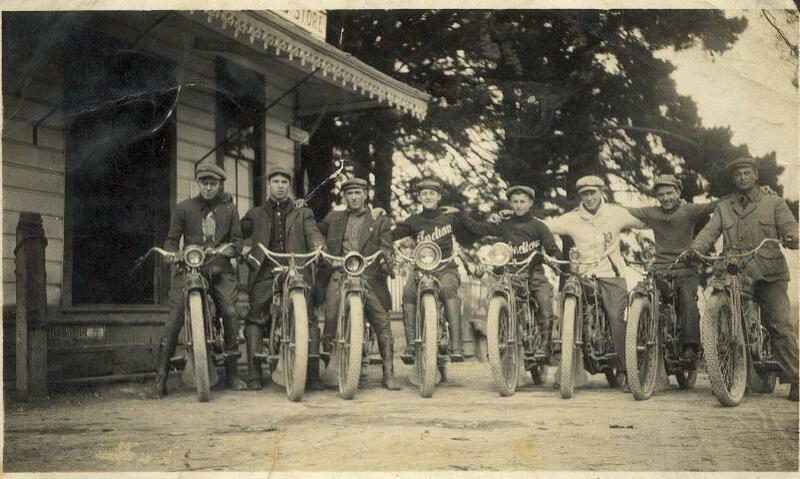 In 1918 workmen hurriedly erected an outdoor prize fight ring on the saloon-fronted San Gregorio Street in Pescaderoâand everybody buzzed about the upcoming boxing match between the newly arrived âKid Zugâ? and his local opponent, âHappyâ? Frey. In California boxing was illegalâso was gamblingâand had it been any place other than Pescadero, the authorities would have clamped down. 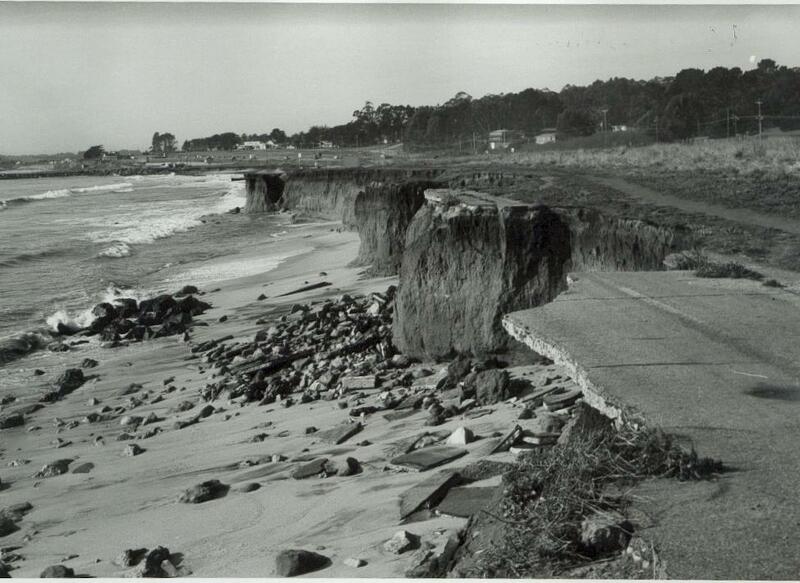 But this was Pescaderoâwest of the magnificent redwood forest on San Mateo Countyâs remote South Coastâand outsiders didnât care (or know) what was going on there. 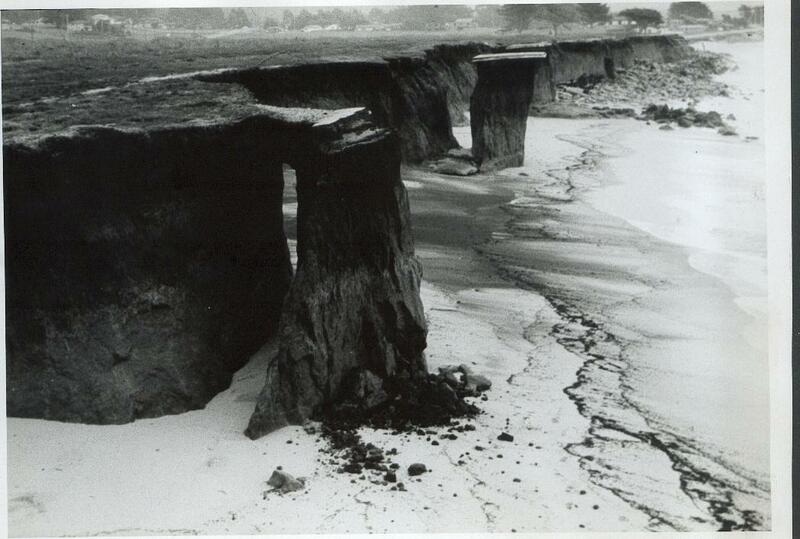 The village of Pescadero was about 70 years old in 1918âbut it was local lore that you could tell what was fashionable by the contents of the cargo salvaged from the last shipwreck. In the 1890s, for example, horse-and-buggy tourists were surprised to see every single house in town with a fresh coat of white paint. They learned that the Pescaderans had been the beneficiaries of a bonanza in the form of tons of paint salvaged from the shipwrecked vessel Colombia. A quarter century later it was more likely that the villagers would be salvaging cases of illegal liquor from the unlucky bootlegging fishing trawlers that had crashed into the dark rocky reefs on moonless nights. 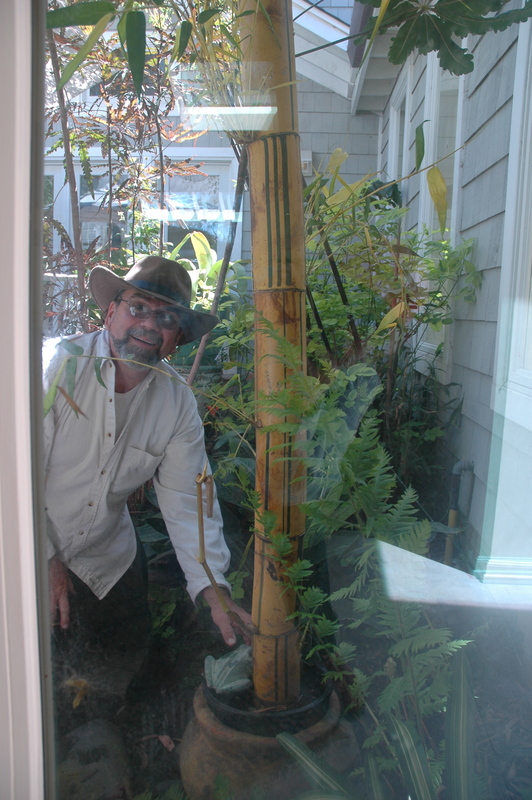 Newcomers to the Coastside village, particularly those with the ârightâ? connections, quickly discovered that slot machines and card games were found in a two=story house at a curve on the lonely road leading east into the redwoods. Even more fascinating were the rumors that certain county officials were regularly in attendance, playing the one-armed bandits. Among the intriguing newcomers was a ruddy, scar-faced ex=pugilist who called himself âKid Zugâ?. He was seen paling around with the owner of the gambling joint. Although âthe Kidâ? explained his presence in town by saying he was a house painter, he was never seen holding a paintbrush. He was much more often seen tipping back a glass of beer at one of the four saloonsâand he never ceased menacing those around them. It didnât take long for the locals to learn the truth: Kid Zug was really in town to act as a strong-arm enforcer.